Can kidney stones cause kidney disease or kidney failure? I covered the short-term symptoms and consequences of kidney stones in my previous post. Let's talk a little about the long term consequences. A question that is often asked is whether kidney stones can lead to progressive kidney disease/kidney failure. This is not an easy question to answer; in fact it should probably be rephrased to say, "can kidney stones be associated with kidney disease/failure?" This is because current medical studies that have addressed this issue have proven association, and not causation. At least, not yet! What are kidney stones? What are the symptoms of kidney stones? 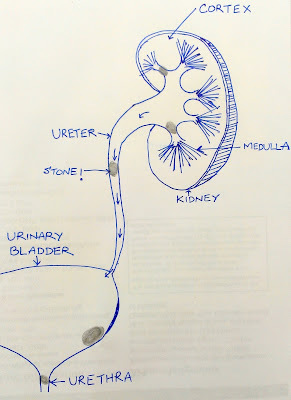 Stones in the kidneys are a common clinical problem. You might see this medically referred to as "nephrolithiasis" or "urolithiasis". For reasons not fully understood, the prevalence of kidney stones seems to be increasing. This could be related to the increase in obesity rates, dietary changes (availability of cheap, high sugar, high salt fast foods), or maybe, even changes in the climate (global warming!). Warmer weather is a known risk factor for kidney stones; which is probably why their prevalence in southeastern U.S. is 31% higher than the northwestern region! So what are kidney stones made of? What are the signs and symptoms of CKD? I see a lot of patients in consultation in my clinic who are, well, not quite sure why they are in my clinic! Usually, they would have been referred from their primary physician because they were deemed to have "chronic kidney disease, or CKD". A frequent refrain is, "Doc, I feel fine. I don't know why they asked me to see you?!" The reality is that CKD belongs to that dreaded class of diseases called, "the silent killers". In other words, you may or may not have any symptoms! In the early stages especially, the only abnormality might be elevated creatinine or reduced GFR when your physician checks your kidney function. Some common misconceptions regarding kidney disease are that the kidneys "should hurt", or you "stop making urine". These are nothing more than medical myths.